YummyInTheCity: One Girl Cookies - Perfect gift for any occasion! One Girl Cookies - Perfect gift for any occasion! One Girl Cookies is a super cute, super sweet artisanal bakery offering a variety of handmade cookies. I was introduced years ago to One Girl Cookies, when one of my girlfriends sent me a box to my apartment after we had a mini-fight. You can bet that that solved all of our differences quickly! 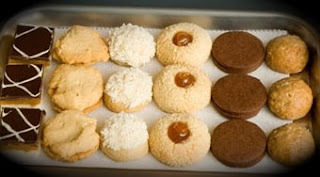 Located in Brooklyn, One Girl Cookies hand delivers around the city sweet boxes of cookies ranging from the classic collection including favorites like the lucia - shortbread chocolate, caramel bar and the penelope - butter cookies with nuts and apricot. For the chocolate lovers there is the chocolate cookie collection, and of course whoopie pies, cupcakes and cakes. The cupcakes are spectacularly pretty - exquisitely crafted and almost to fancy to eat. I said almost. 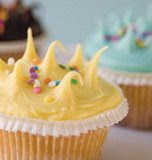 At $2 each, they are on the cheaper end of NYC cupcake offerings - order 2 dozen for the office to gain instant popularity points! For those out of town - One Girl Cookies delivers to several states in the middle of the country. Sorry West Coasters, you'll have to request hand delivery from your Manhattan friends when they come to visit! Beautifully packaged in brown boxes with vintage pictures - One Girl Cookies make a great gift for a housewarming, wedding party favors, mother's day or birthday. One Girl Cookie also has special celebration catering - set up a Cookie Bar for your bridal shower or baby shower and guests will be talking for days about it.